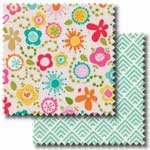 Pelenna Patchworks: New in - Summer Breeze patchwork fabric by Riley Blake Designs! New in - Summer Breeze patchwork fabric by Riley Blake Designs! Brand new in we have 12 fabrics from the Summer Breeze patchwork fabric range by Bella Blvd for Riley Blake Designs. These pretty prints come in fresh, bright colours including pink, yellow and turquoise and are perfect to inject a bit of colour into the house ready for Spring! Also available in a stash pack and a discounted 8 fat quarter pack. Quilting and rotary cutting tool sale now on!